We love finding out about exciting new uses of technology in the performing arts industry. The Laptop Orchestra of Louisiana is a great example. 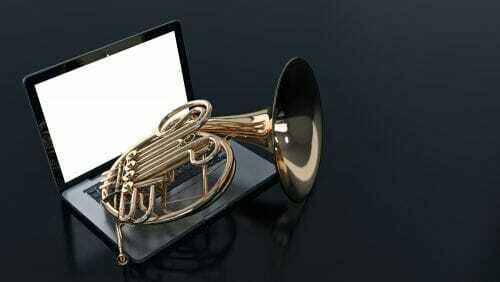 For an orchestra, they travel light… they’ve been touring the United States armed only with their Apple Macs! The Laptop Orchestra plays live to audiences on stage, combining talented musicians and their laptops to create evocative and interesting music, typed or swiped on the musicians’ trackpads. Watching the Laptop Orchestra has been described by some as being a little like watching the musicians communicate via instant messaging. By “messaging” each other, the musicians are able to keep time and this replaces the traditional role of the conductor. The Laptop Orchestra is not alone, because experimental, electronic music performed entirely on laptops is becoming an increasingly popular trend. Laptop musicians hope to challenge preconceived notions about what music is and isn’t, as they perform live onstage in front of audiences, just like a traditional orchestra. The compositions are detailed and complex, with most of the musicians using computer programs that they have created themselves. Studies have shown that maths and music are inextricably linked and the Laptop Orchestra certainly seems to confirm this. So far, audiences have been impressed by the music itself, the way in which it’s performed and the process behind it. Many laptop musicians combine their performances with other theatre technologies, like projectors, visual displays and interesting use of stage lighting. It’s this fascinating use of technology that captivates audiences and keeps the performing arts so interesting and alive.